In A Powerful Blessing, an absorbing, affectionate, and scholarly biographical narrative about his father, the Reverend Douglas Carpenter notes that his sources were "letters, diaries, notes, and clippings saved at the time of the events, scrapbooks, conversations with people on site, and [his] own memory, which extends back to the summer of 1936, when [his] family moved to Birmingham from Savannah." Three decades later, the Reverend Martin Luther King Jr. wrote his "Letter from Birmingham Jail" to eight members of the Birmingham clergy, including Episcopal Bishop Charles Carpenter. Although these ministers became "metaphors for inept southern pastors in the face of the sweeping tide of the Civil Rights movement...[t]hey mostly stood in the middle, trying to move civil rights along without causing bloodshed. In those days when the vast majority seemed to stand at one extreme or the other, there was not much standing room in the middle.... ‘Compromise’ is a word that seems seldom used with respect." During that turbulent time, Bishop Carpenter had his work cut out for him. 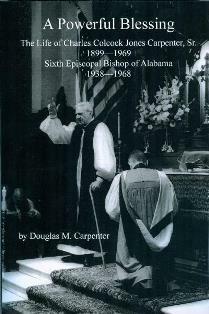 His son, the Reverend Douglas M. Carpenter has done a remarkable job of consolidating and presenting this ecclesiastical history. Every page includes quotable content. A Powerful Blessing includes a center section of black and white photographs, and for those who were alive fifty-plus years ago and sensitive enough to be aware of how the social grounds were shifting in Alabama, the opening chapters of this book will be like turning the pages of a photo album.